Tualatin Skunk Removal can solve any of your skunk problems and prevent them from happening again. When you have skunk's under your house, deck, or shed it can be a very big hassle. And the most difficult part is not just trapping them, but then what do you do with them? We have been solving wildlife problems for years and can solve your skunk problem with little stress on you or the critters. 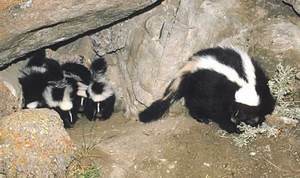 In some cases a skunk will spray under or near your house and the smell can stay around for a long time. We are able to remove the smell with a deodorizing fogger that is also food grade. This means that it is children and pet safe. We also are able to seal up all the areas that skunks have been getting in or could possible be getting in. This will prevent future problems not only with skunks, but with raccoon's, opossum's, and other pest critters. Tualatin Skunk Control and Removal Call 503-201-2432!